These days, a blog just isn't a blog unless it's giving something away. I've seen giveaways for countless toys and games for your kids, but rarely something just for Mom. 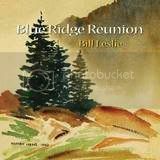 This week, we are giving away a copy of Bill Leslie's newest book and CD, Blue Ridge Reunion. Granted, if I want Christopher to go to sleep in the car, it's the first CD I go to. He's usually out by the end of the first track. And the book is a picture book . . . but not the kind you are used to reading before bedtime. The pictures in this book were painted by Bill's father. He was a watercolor artist, much like Bill is a musician. On the side. Bill's father owned a bookstore in Morganton, North Carolina. Bill says they carried a little bit of everything really. And after hours, his father would paint. Like his father, Bill pursues his artistic passions after hours. He is an award winning anchorman on WRAL in the mornings, and an award winning musician on the side. The paintings in the book are incredible portraits of the North Carolina mountains. There is, in my humble opinion, no place on earth more beautiful than western North Carolina, and William Leslie captured that beauty in simple, pure, watercolors. I don't have to wax poetic about the beauty of Bill's music. Plenty of people have done that already. Yo-Yo Ma called Bill "one of the greats in modern Celtic music" during an interview Bill was conducting with him, and author Jan Karon uses Bill's music on her website as the perfect musical backdrop. The CD has been receiving generous airplay on new age stations around the world, was number 1 on the world music charts in September and number 2 in October. I cite my references as I glow about him because I am a little biased. Those are my backing vocals you will hear on the three vocal tracks. I laugh when I say that I'm finally doing music my parents enjoy, but it's true, and I'm proud of that. Bill has generously given us a copy of both the book and the CD to giveaway here on Triangle Mamas. He has a soft spot for babies and for mamas. The three ladies he shares the WRAL news desk with have six children between them, Christopher attends our band rehearsals on my back in our Babyhawk, and our violinist will be bringing her nine month baby belly to our gig at the Grove Park Inn in February. That's Mr. Leslie just above there with a tiny tiny Little Bird way back when. . . Pardon my distraction. He's just such a cute baby. You want this CD. You want it with a glass of wine, a warm bath, and a husband who is watching your kids for an entire hour. The book is going to look beautiful on your coffee table, and I dare say we can even get him to sign it for you if you like. For anyone who loves North Carolina, this is the perfect Christmas gift. Even if that "anyone" is yourself. Leave us a comment. That's all you have to do to enter. Link to our contest and leave us another comment with that link and you get two entries. It's that simple. Entries will be accepted until midnight this Friday, December 12. We'll post the winner over the weekend. Please make sure that we can get in touch with you via email in case you win! This is an original Triangle Mamas post. Marty can also be found blogging at her personal blog, Don't Take the Repeats when she isn't slacking off on Facebook. Two weeks ago, I made the kids commit to their Halloween costume plans and then went shopping. Apparently, however, two weeks before Halloween is a better time to buy Christmas decorations than anything orange and black. The aisles were bare or picked over with the only costumes remaining being ones made for dogs. My sons had two choices: dress like a slutty pirate girl or like a Golden Retriever dressed as a slutty pirate girl. I should have known back in August when I couldn’t find the back-to-school supplies because they had been cleared out to make room for the Halloween stuff. Next year, I’ll know better. This year, I needed a plan B. Dean was easy. He was wooed by the chance to accrue accessories of the macabre – a Styrofoam skull and a plastic dagger. Logan, being two, doesn’t really care. A few days later, I stumbled upon a penguin costume in the correct size and on sale for under $10. Done. Jess is adamant that he will be a green dragon. A fire-breathing dragon, by the way. I thought that a dragon would be simple to create and that I was getting off cheap and easy. I would simply buy a green hoodie and some felt – done. Except about a dozen stores later, I still could not find a green hoodie, green felt, or a ready-made dragon costume (not made for a dog). And I did consider the dog costume wondering how dog poundage related to kid size but I felt $30 was a little steep for something made for a dog. So back to the fabric store I went and over $40 worth of materials later, I am sitting at my long-lost sewing machine making the whole damn thing. Five years ago when I left my paying job for the adventures of staying home with the kids, I initially put a lot of pressure on myself to be the perfect Alpha-mom. My sister was my roll-model and she is a firm believer in the essence of mommy-hood being in the making versus the buying of things - including the sewing of the Halloween costumes. So in my first stint home full-time, I made my sons’ costumes. It was an easy choice to make since an Obi-Wan Kanobi costume in size 4T was impossible to find at the time. However, I firmly believe that if you can find something ready-made that is just as good as what you can make, it is more efficient and probably less expensive to just go ahead and buy. Because while it is nice to be able to say, “I made it myself,” it can be a little stressful. We often joked that if we ever hosted our own sewing show, we’d call it “Pinpricks and Profanity.” Sometimes the frustration of trying to make the sewing machine cooperate is just not worth the effort. So while I don’t think sewing costumes is a “Mommy Must-Do” activity, I admit that I don’t have a problem with actually doing it. 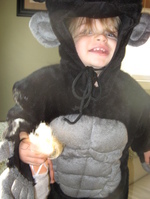 Except for the time wasted searching for the easy shortcut, I am quite happy to make a costume for my child. In fact, I have been known to make costumes for other people’s children and if I had just started the “from scratch” approach several weeks ago, we wouldn’t have been in crunch time this week. And my husband thinks I am crazy for making life harder for myself when a Halloween costume should not be a life’s priority right now. He wants to know why I didn’t just tell my son to choose some other costume so we can be done. Well, because two weeks ago, this did seem like the cheaper easier choice. But here is where I pull the selfish card – yesterday as I gazed upon my kitchen table made-over into a sewing studio, I sighed with contentment. I realized that I like a project. Rather than feeling overwhelmed, I was eager to begin. Halloween is the one time a year that I can haul out the sewing machine and create something from start to finish, without feeling like it’s just my own little hobby. Like making cookies rather than buying the perfectly fine bakery brand, the satisfaction of having made it myself has been worth the trouble. And the mommy and son moments in making the costume together have been simply priceless. "Pinpricks and Profanity" is cross-posted on Susie's personal blog At Home With Me where she chronicles her sewing escapades and other adventrues of being a mom to three boys. Happy Halloween from Triangle Mamas! Abby the beautiful lioness with her mama, Nikki. Anna and JD, children of our soon to be introduced blogger, Tonya. 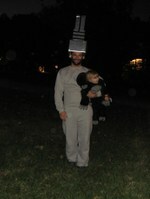 Linus as King Kong with his Empire State Daddy, and a shot from a Halloween party. Just a tease from tomorrow's post from Susan. Here's her mom-made dragon costume. And finally, Marty's family of pirates. Arrrrrrgh. Hope you all had a fabulous Halloween weekend! Stay tuned tomorrow for the saga of a sewing mama. Looking for a little Fall fun? Feeling the crunch of tough economic times? Look no further than Ganyard Hill Farms in east Durham. Aside from your usual run-of-the-mill pumpkin patch fare (hayrack rides, corn mazes, cow milking), Ganyard Hill Farms offers plenty of adventure for your more stingy frugal economically conscience parents. Start your fiscally responsible adventure with the petting zoo where you get to pet the painted plywood black cat. Feel how soft fuzzy bumpy the kitty's fur is... nice, huh? This beats feeding goats any day, right? Next who needs a corn maze when you can try out the absolutely free wooden pallet obstacle course? Test your limits by maneuvering over the pumpkins while avoiding getting caught between slats. Now, that you're really having a good time, why not pass on the hayrack ride and take a trip on the Daddy Express? Sure, you get this ride most every day, but here you can take in lovely views of the porta-potties, old barns, and of course all those other kids suffering through their time on the Hay Mountain. Last but not least, don't forget to pick up a pumpkin. Because your parents are cheap thoughtful, you don't have to wander through patch after patch before locating the perfect pumpkin. Instead, you are presented with aisles of pumpkins similar to shopping at Wal-Mart. Convenient, right? Boy, oh boy, are you one lucky kid to have such tightwad adventurous parents. Crossposted at My Sweet Babboo. Abby is a stay-at-home mom of a one year old who blogs at her personal mommy blog, My Sweet Babboo.